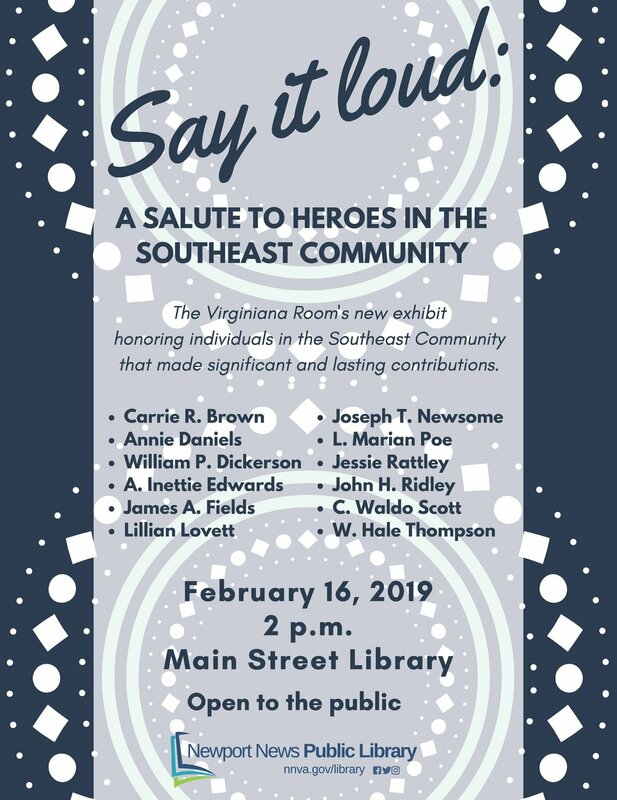 A new exhibit is opening in the Virginiana Room for Local History and Genealogy at Main Street Library on Saturday, February 16, at 2 p.m., titled “Say it Loud: A Salute to Heroes in the Southeast Community.” The unveiling will honor African American individuals from Southeast Newport News whose contributions have impacted the City and Virginia. The program will include guest speakers and a performance by the Crittenden Middle School choir. The purpose of this project is to pay tribute to those individuals whose community activism has produced an enduring historical legacy in Newport News. The physical exhibit will honor each hero with an individualized Black History poster that will highlight his or her significant achievements. The posters will be on display from February 16 through August 2019. In the future, digital archives from the Southeast Community will be available to the public, featuring a permanent online collection available through the Library’s website. For details about this project, contact Jillian Wagner, Virginiana Room Librarian, at 757-591-4858.